​We wish to extend a huge thank you to Taylor Kueck of Mighty Pine Designs & Photography for our beautiful farm logo! ​WOULD YOU LIKE TO KEEP UP WITH US? Lady Walkers Half Moon Farm is a breeder of Nigerian Dwarf goats in central, western NJ. We have been breeding goats since 2011. Our first priority at Lady Walkers is to raise healthy and happy goats. We are as happy to see them as they are to see us! When we moved to our farm, we brought with us my husband's two Tennessee Walking Horses, Handshaker's Painted Money and Gen's Hard Money. The HALF MOON part of our farm name represents the colors of the horses (black and white). Our goats are registered with the American Dairy Goat Association. Some of our goats are also registered with the American Goat Society. Our tattoo sequence has been registered with ADGA and AGS. ​We participate in ADGA Linear Appraisal. We attend a variety of ADGA-sanctioned Dairy Goat shows every year. The Nigerian Dwarf goat shares the desirable characteristics of dairy conformation evidenced in the standard-sized breeds, though they are proportionately smaller in scale. Nigerians are angular and refined, with flatter, flintier bone and much less muscling. Its legs are refined and longer in relation to body size. They evidence more "stretch" from a longer, leaner neck to a longer more level rump. Because of its inherently functional type, the Nigerian Dwarf is a reproductively sound breed. All colors and color patterns occur. The Nigerian Dwarf has the ability to fill a unique niche in the dairy goat world. It is ideal for those who have limited space, who do not need large quantities of milk or lack acceptable outlets for the surplus, or those who require animals easily managed by one person. The Nigerian Dwarf is a fully-functional, productive dairy goat that just happens to be small. Breed Status: April 2013 graduated from "Recovering" status! Two miniature goat breeds are found in the United States, the Nigerian Dwarf and the Pygmy. These breeds share a common genetic origin in the variable population of small African goats imported to the United States between the 1930's and 1950's. Used originally as exhibition animals in zoos, the goats later became popular as companion animals. The Pygmy goat breed was recognized by the American Goat Society in 1976. During the last two decades, it has been standardized through selection for small size and stocky conformation. primarily agouti, though other solid colors along with the belted color pattern are also accepted. The Nigerian Dwarf breed originated from the same genetic foundation as the Pygmy, but these goats have been selected to resemble miniature dairy goats with more slender bodies. All colors and patterns, including bi- and tri-color combinations. are accepted. Horns may or may not be present. Nigerian Dwarf goats vary in size, with bucks' height up to 23 1/2" at the withers and does' height up to 22 1/4". The ideal size of the breed, however, remains a point of debate within the breeder community and there are now several breed organizations reflecting differing philosophies. The Nigerian Dwarf was originally selected as a companion and show animal, with emphasis on the breed's graceful appearance and gentle disposition. The production qualities of the breed, however, have also attracted attention. Nigerian Dwarf does produce one to two quarts of milk a day. The milk is high in butterfat and makes excellent cheese and butter. Does generally breed year-round and produce twins. They can be milked for up to ten months, but can also be allowed to dry up on their own if milking is no longer desired. These production qualities make Nigerian Dwarf goats good candidates for small scale milk production where a year-round supply of a moderate amount of milk is the goal. The versatility of the Nigerian Dwarf, as well as its hardiness and gentle disposition, have given it great appeal, and the breed's population has increased significantly in recent years, registering nearly 7000 purebred animals in 2002. The breeder community faces a challenge, however, in determining the parameters of the breed. Selection for production qualities may tend to increase the size of the goats, while selection as a companion animal may emphasize small size. Breed conservation will be best served by building consensus around a vision for the breed that includes its unique combination of characteristics. YOU CAN GO TO THIS WEBSITE TO VIEW THE VARIOUS COLOR AND COAT PATTERNS OF THE NIGERIAN DWARF GOAT! 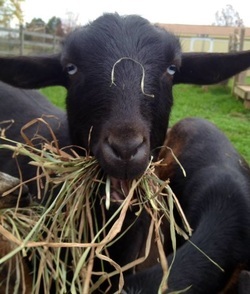 ​We feed all of our goats locally-grown Orchard Grass hay. We also feed our does Chaffhaye, a premium-quality alfalfa which is mold, dust and GMO free. trace minerals for increased bioavailability to promote muscle tissue and bone growth. Decoquinate has no withdrawal period. Crude fiber 8%. This 16% crude protein quality pellet feed provides balanced nutrition in every bite. Like Honor Show Chow (another good choice for pellet feed for goat kids and bucks), this feed has ammonium chloride (to lessen the likelihood of urinary calculi) and is medicated with decoquinate (for the prevention of coccidiosis). This is a high-fortified, complete medicated feed for growing and finishing goats. The fixed-component formula contains yeast culture for increasing digestibility and chelated trace minerals for increased bioavailability to promote muscle tissue and bone growth. Decoquinate has no withdrawal period. Crude fiber 8%. This is a high-protein, high-energy, fixed component feed (20% crude protein) designed to maximize production and promote healthy growth. The pelleted form eliminates the chance of goats sifting out ingredients. Premium Dairy Goat Pellet contains yeast culture and probiotics for a more stable digestive tract environment, resulting in improved digestion and overall goat health. This premium pellet also contains chelated trace minerals for greater absorption and utilization of zinc, copper, and manganese resulting in enhanced reproductive performance and growth. Crude protein 20%. Crude fiber 8%. This coarse-textured sweet feed is formulated with crimped oats, flakes and cracked corn, pellets and molasses. It is an 18% crude protein feed. This very palatable feed is a highly- fortified, fixed-component formula ideal for dairy goats. It features chelated trace minerals for increased mineral bioavailability and yeast culture for increased digestibility. Crude protein 18%. Crude fiber 8%. This is provided free choice to all does at all times. We sometimes add Sunshine Plus to our lactating does' daily grain since it is a heavily fortified, complete supplement. Sunshine PlusTM contains yeast culture and MosPlusTM. It is formulated to balance forage diets and to enhance the level of nutrition in cattle, horses, goats, rabbits and guinea pigs. Sunshine PlusTM is an excellent “lite” feed for animals that require minimal to no grain. Multiple Protein Sources - A 30% protein supplement containing soybean meal and dried whey ensures quality protein is available to meet the amino acid requirements for young growing animals and to sustain muscle and tissue strength for performance and showing. Sunshine PlusTM will help meet the protein needs of animals with limited intakes or those fed low-protein grass hay. Palatable Pellet - High quality feed ingredients are incorporated into a highly palatable, highly digestible, pelleted form to ensure a consistent intake of protein, minerals and vitamins in every bite. Bio-Available Selenium and Vitamin E - Together, selenium and vitamin E act to maintain normal muscle function, aid in the prevention of muscular disease, and provide antioxidant protection to body tissue from oxidation induced damage. Overall health and performance is maintained by these important immune system nutrients, especially during times of stress. ​Chelated Zinc, Copper and Manganese - The greater absorption and utilization of zinc, copper and manganese helps meet the increased needs for bone, muscle and tissue strength in show and performance animals. Overall reproductive performance and efficiency is sustained in breeding anilmals. B-Complex Vitamins (including Biotin) - Added B vitamins aid in the efficient breakdown and transformation of nutrients into usable energy, especially during conditions of stress. B-vitamins are involved in the maintenance and strength of growing bones and joints, as well as the maintenance and production of healthy skin, hair and hoof tissues. Yeast Culture - Promotes a functional microbial fermentation, sustaining nutrient digestibility and utilization with fewer digestive problems. MosPlusTM - Supports the presence of beneficial bacteria in the digestive tract, resulting in an active and healthy intestinal environment. Black oil sunflower seeds contain vitamin E, zinc, iron, and selenium and also add fiber and fat to the diet. BOSS make the goats' coats shinier and increase the butterfat in their milk. We mix the seeds into our goats' grain .... they eat them, shell and all. Beet Pulp is the vegetable matter that remains after sugar is extracted from sliced sugar beets. It is bulk feed, high in fiber and unique in that its fiber is extremely digestible. Despite being a byproduct of sugar beet processing, beet pulp itself is low in sugar and other non-structural carbohydrates, and it contains calcium and phosphorus. Beet Pulp swells tremendously when moistened which pulls the ration apart in the animal's stomach and allows the gastric juices to circulate freely. When needed, we make a "mash" of beet pulp, grain and warm water to help keep weight on an animal (bucks in rut, does after kidding, during milking, etc.). We offer our goats free-choice baking soda to our goats which aids digestion by keeping the rumen pH-balanced.